I learned how to make a homemade Bloody Mary mix even though I don't drink alcohol. I wanted to make it for my friends who like this drink. It can easily be made when you are canning tomato juice. This drink when mixed with vodka is so popular at cocktail parties especially for the holidays. By making homemade recipes like this, mixing drinks become a breeze. All you need to do is add the vodka and maybe ice with a garnish. The mix already has the tomato juice with a variety of spices and flavorings. The Bloody Mary drink is a favorite of many people. It is a spicy drink (often real spicy) and dates back to the 1920’s. The name is attributed to many different people; from a bar maid to Queen Mary. Another source for the name comes from a ghost called Bloody Mary in folklore which is also indirectly related to Queen Mary. As in most folk tales the story varies depending on who is telling it but it has to do with all the false pregnancies and miscarriages of Queen Mary. The Bloody Mary is one of the limitless range of alcoholic beverages served at dinner parties and cocktail parties. The potential flavorings run from many different spices, vegetables, herbs and sauces. Traditionally, this drink is mixed in a shaker with ice and seasonings. After shaking, it is poured into a glass and served with garnishes. Like most drinks, it can have added sugar or be served tart. It can be mildly seasoned or it can be very spicy. Even the amount of alcohol added can vary according to taste or some choose to change the vodka to other alcohols. 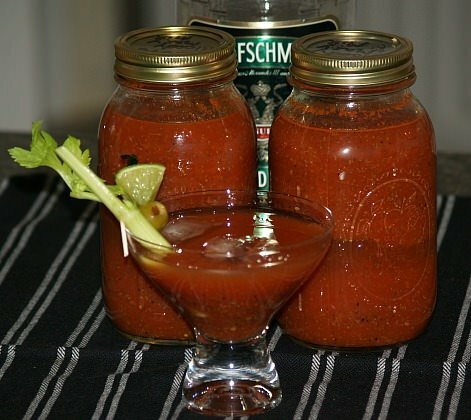 When you first learn how to make a homemade Bloody Mary mix, it is jsut like you are canning tomato juice. First wash and drain firm red ripe tomatoes. You need to make sure all decayed spots or blemishes are removed. These can cause the juice to spoil. Next cut tomatoes into quarters or small pieces. Slowly simmer the tomatoes until soft stirring often. Press the tomatoes through a fine sieve or food mill. Put the juice and about half of pulp back into kettle. NOTE: At this point you can add whatever seasonings you like or you can proceed to can tomato juice. To make the homemade Bloody Mary mix, I am giving you some suggestions below. NOTE: To serve a Bloody Mary Drink fill a tall glass with ice, add 3 ounces vodka (or desired amount), fill glass with homemade Bloody Mary mix and garnish with a stalk of celery taller than rim of glass. 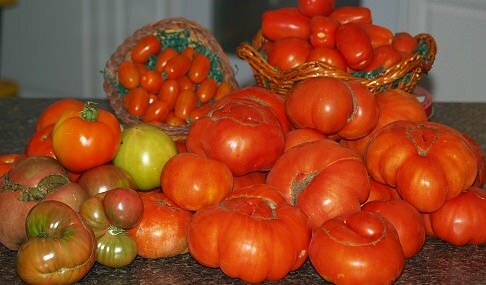 Dip tomatoes in hot water then cold water to remove peels. Slowly simmer until tender stirring often; no water tomatoes will produce their own juice. Press through fine sieve; return juice to kettle (I like to add half of pulp to make thicker mix). Add remaining ingredients and bring mixture almost to boiling point. Pour into hot sterilized quart canning jars leaving ¼ inch headspace. Wipe rims and adjust caps. Process for 15 minutes in boiling hot water bath. Check lids (by pressing down on tops) to make sure they sealed tightly. Store in a cool dark place at least 1 month before serving to enhance flavor. If you do not want to make homemade Bloody Mary mix, use your home canned tomato juice. The following is a recipe to mix each glass. This Scotch recipe can be made with the homemade Bloody Mary mix or with your home canned tomato juice. This is good for people prefer Scotch over vodka. Pour the scotch and juice into ice filled highball glass; garnish with cucumber and ginger. Combine and blend together; pour over ice filled glasses. Cover bones in a large pot with water; bring to a boil, cover and cook about 30 minutes. Chop all vegetables into bite size pieces; add all remaining ingredients to the pot. Cover and cook 2 ½ to 3 hours until meat falls off the bones. Season to taste with salt, pepper and Tabasco sauce. If you do not want to make the homemade bloody Mary mix but still like the drink, try this recipe. Combine all the ingredients EXCEPT the tequila in a food blender; process until smooth. Cover and chill mixture for at least 4 hours. Pour 1 ½ ounces of tequila in each of four glasses; pour in ½ cup of tomato mixture. Stir and add ice if desired. Learn how to make Bloody Mary mix to make recipes like this gelatin salad. Sprinkle gelatin in water: heat slowly until gelatin dissolves. Stir in the cocktail mix; chill until partially jelled (Consistency of egg whites). Stir in onions and celery; pour in a 2 cup mold and chill until firm. Combine all ingredients EXCEPT vodka; stir well. Chill for 8 hours; if desired stir in vodka just before serving. Serve over ice; make 2 quarts.